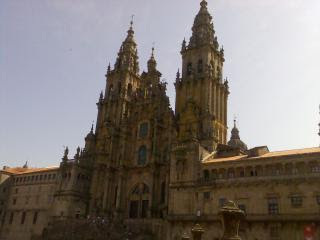 Today my second camino has ended. The last 19 km from Pedrouzo was a nice morning walk. I got to see old Jim yet again. Got into cathedral just in time for the mass at noon. I have decided to stay today and tomorrow in this happy city, seeing the pilgrims come in and crying in joy. Will be leaving tomorrow night (overnight train) for Madrid and departing from Madrid on Friday, finally arriving home on Saturday. One note. This pillar of Saint James is under restoration. As you can see, a barrier has been put around it. Bummer. 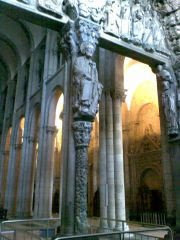 Pilgrims this year won't be able to put their hands on the pillar and knocked their heads on the small statue behind it.